Oh, I remember I wanted to read Old Magic but then I forgot. I don't really know many other time travel books save for a couple of historical romance ones and this one called Once Every Never or something like that. I've yet to read a book about time travel!!! I will have to add one of these to my TBR pile. Btw, it's Lah from LazyGirl Reads but I've changed my blog name! La Toya @ La Toya, literally. Is it sad that I wanted to join this challenge just because the button is so pretty? 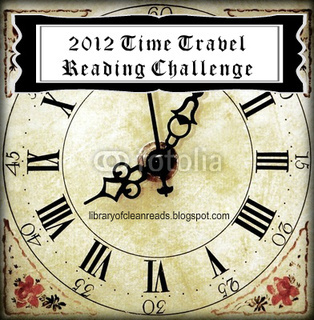 My problem is that I feel like I won't be able to come up with 6 books to read that deal with time travel. It seems to be on the outs. That's why I haven't signed up yet, though I may change my mind, if only to have that pretty pretty button on my sidebar all year. I AM THAT VAIN. Logan, Um, maybe it's sad, but I'm easily seduced by pretty buttons so I am not one to judge you :P Like your All Male Review challenge. Any thought of resisting was completely obliterated by the button and the name. Best button ever! I'll be doing this one too! I'm excited to finish off The River in Time Series. Also, I have Ruby Red on my shelf so I should read that too. I'm so excited you're joining me on this challenge! I too will be reading The River of Time Series and I can't wait to start. I was so touched by all the comments on my button. I spent considerable time looking for the right pic for it and it payed off. Looking forward to reading your reviews! Have you read Ruby Red? That's a time travel novel and Sapphire Blue will be out this coming year so it will be another time travel novel. Two for your list. I don't understand what you mean about Lia and Luc's story. Haven't you read the whole series? Or are you saying she's writing another story? Aylee, I can't wait for you to finish The River of Time!! I think the second book is my favorite, but I really love all of them so much it's hard to choose. I've heard really great things about Ruby Red. Laura, I adored the River of Time series! I hope you enjoy it. Your button is gorgeous, so the time you spent on it was most definitely time very well spent :) Thanks for hosting! Heather, I have not read Ruby Red yet. I had it in my hands from the library, but then I returned it unread. I think that's a series that I will wait until all the books have been published before I begin. It sounds so good, so I want to be able to just read it straight through. As for Lia and Luca's story-- I have read all of the series, but Lisa said she is considering writing another trilogy focusing on Lia and Luca! I would SO love it if she did that. I actually saw someone have Tributary on their Good Reads List. Is it true? And I know she has another historical fiction book. Wasn't sure if that was one you signed up for or not. Another whole series??? Please let's do another read a long!! Yes! I have Tributary on my Goodreads list! That doesn't actually mean anything, but hopefully it will be published. I intend to read her upcoming historical fiction book for my HF challenge. :) Yes! I would love another read along!